I needed curtains for my den in progress. We have high ceilings and huge windows. I looked high and low and quickly realized we were going to have to take out a second mortgage to buy curtains for the space. I looked at blogs for ideas and alternatives. 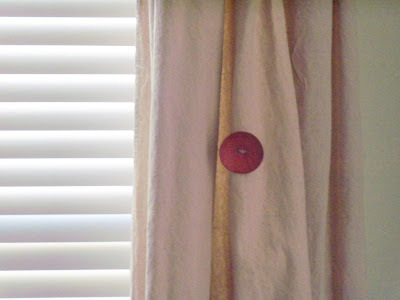 Finally, on The Lettered Cottage (no surprise there), I found the idea of using drop cloths for curtains. That really gave my husband a big chuckle but off to Home Depot we go. 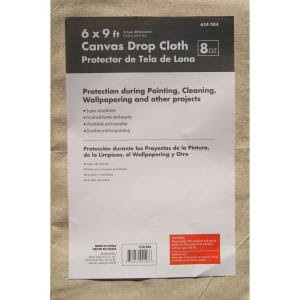 We find the drop cloths and they are about $10. bucks each. They are 6'x9' and hemmed (which is huge since I don't sew). So we bought 4 for a total of $40. What did we have to lose? If we don't like them, we can use them as drop cloths. 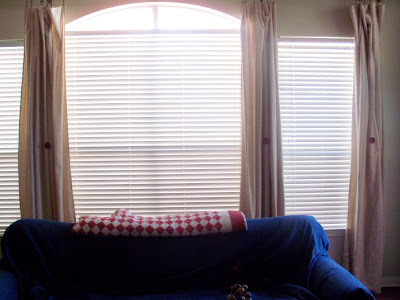 We also bought drapery rods and drapery clips to hold the "curtains." We got them home, opened them up and they seemed a little stiff. So, I decided to wash them all on gentle cycle and dry on delicate. When I opened the dryer to get them, do you know what came out? The perfect impersonation of vintage linen drapes! Are you kidding me? We hung them up so fast. I loved them. What's better than forty dollar drapes...for four panels? Well, I tell you. 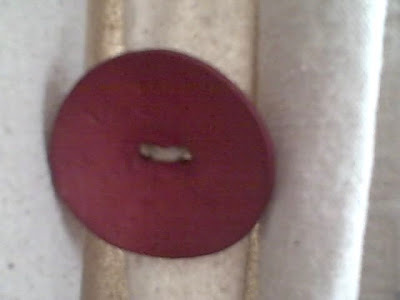 I went to Hobby Lobby and bought 4 huge wooden red buttons and put one on each panel. Just a little whimsical touch. If we pull them closed, they completely cover the windows since they are six feet wide. New vintage linen curtains, 9 feet tall, 6 feet wide, no sew, 4 panels, 40 bucks. You can't beat that! I did drop cloth drapes too. Posted about them awhile back, and think they're the greatest since sliced bread. Or chocolate. Either one. Oooh I did them too in my family room! I love this! I am SO DOING THIS! We are moving upstairs and giving my parents our downstairs room and bathroom....and the ceilings are high and there are lots of windows. What a great idea...and you did such a good job. I'm so impressed. Your picture makes the curtains look awesome! I just love it. I would be so proud of myself if I were you. And just what does your sweet hubby think now? I bet he is bragging on his gal to some of his friends!!!! isn't it great to find something so basic that turns into something so chic and current!? 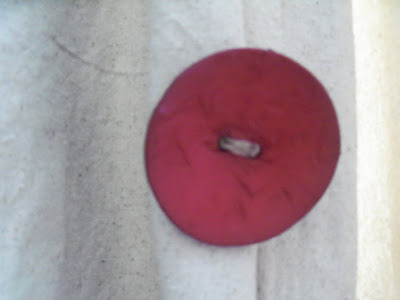 they look great especially with the red buttons...cute. i can't wait to try my hand at some curtains and slipcovers. These look great. Drop cloths are also great to cover chairs, too. Love the buttons! Great job!!! So creative! I am your newest follower! Thanks everybody! For all of you except Cottage Instincts, I can't wait to visit your blogs. 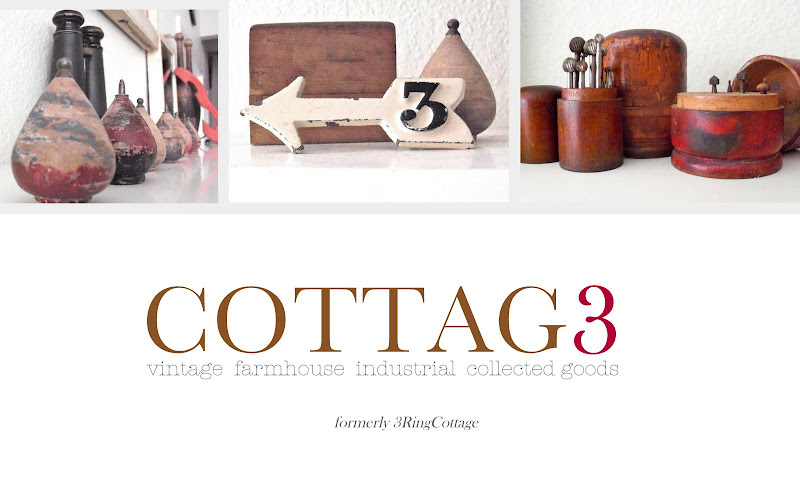 As for Cottage Instincts, I'm a follower and yours is one of the first blogs I check everyday! I have been wanting to do that too. Did they slip through a rod. Ok, I am finally going to get me some this weekend! That is so adorable! Thanks for linking up to Thrifty Thursday and sharing this week! I hope you will come back to visit me soon. If you haven't already, be sure to enter the giveaway. No, they didn't slip through a rod although you could sew them to create the pocket. I just used the drapery clips to hang them. Just took a couple of minutes so they are just as easy to hang as they were cheap! Thanks so much for the visit to my blog and for entering my giveaway! So nice to meet you and to discover your lovely blog in return! 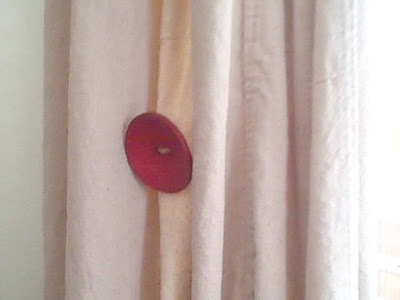 I love my dropcloth drapes too, but the red button you added really adds some personality. Love the quilt on your sofa.